Introduction: Laparoscopic skills acquisition is an important part of residency training. Early training may help with more advanced laparoscopic skills acquisition. Thus, we feel that laparoscopic skills should be taught to first year general surgery residents. This study investigated the hypothesis that a one month dedicated laparoscopic skills rotation would yield appropriate laparoscopic skill levels as defined by the technical skills portion of the Fundamentals of Laparoscopic Skills (FLS) test. Methods: First year general surgery interns that underwent a dedicated laparoscopic skills one month rotation were included in this study. The one month rotation included didactics, recorded procedures observation, FLS module, box trainers, virtual reality trainers, and porcine procedures. All interns were administrated the technical skills portion of the FLS test by a certified FLS proctor. Results: There were 8 general surgery interns included in this study. At the end of the rotation, 100% of the general surgery interns passed the technical component of the FLS test. Mean technical skills portion score was 80 (range: 66 to 87). Conclusions: A one month dedicated laparoscopic skills rotation results in 100% success rate for the technical portion in the FLS test. 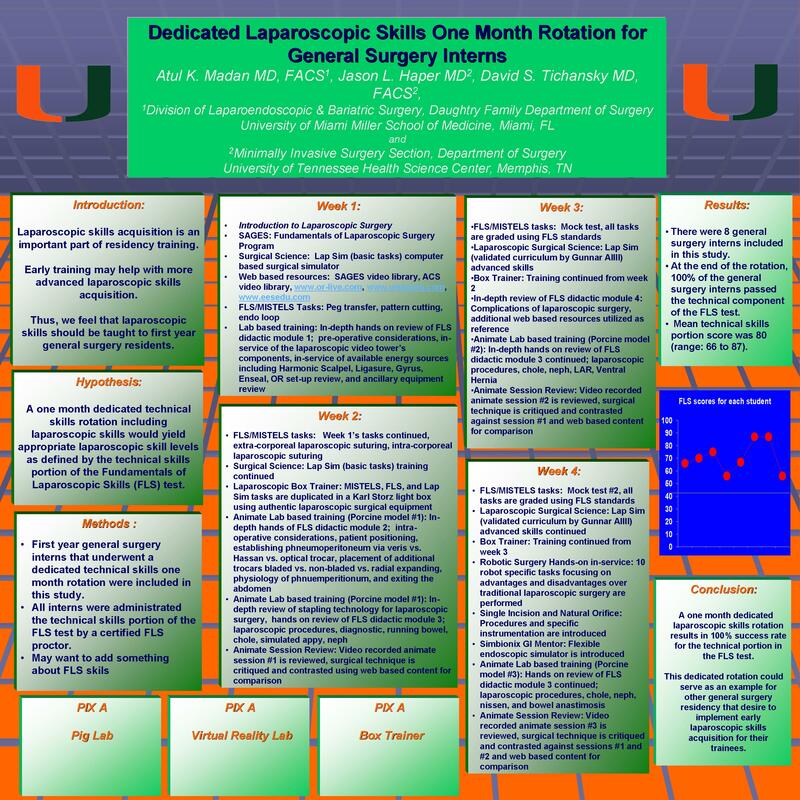 This dedicated rotation could serve as an example for other general surgery residency that desire to implement early laparoscopic skills acquisition for their trainees.